Ishmael Beah’s previous book, the 2007 memoir A Long Way Gone, examined the life of child soldiers in Sierra Leone’s civil war. Beah’s new book, the novel Radiance of Tomorrow, explores the aftermath of war as people return to their homes and rebuild their lives. 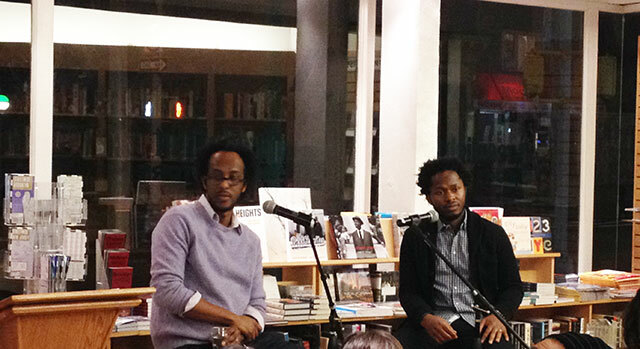 Beah read from the novel at Greenlight Bookstore where he was joined by Dinaw Mengestu in conversation. Mengestu is an Ethiopian born, American novelist. His novel, All Our Names is forthcoming in March, and is the author of three other books. Mengestu and Beah have known each other for some time and their rapport is an easy, conversational style. After Beah reads a brief segment from his novel, Mengestu begins the conversation by asking about Beah’s transition from memoirist to novelist. Beah explains that the idea for the novel entered into his mind even as the memoir was coming into existence. People–meaning the foreign press–want to focus on the war, but the moment the violent bloodshed ends, these people leave as though the problem is solved. To Beah, its obvious that as many challenges exist in peace as in war. Part of the novel he wrote while in Sierra Leone, but he also spent time in Central African Republic, a nation often overlooked by the west. He says the people he encountered provided source material. Mengestu points out that Beah seems frustrated that with the end of the conflict, the entrenched problems persist. When the war ends, Beah explains, there are a lot of scars that need to heal. People need to learn how to live again and be joyful. The goal of his novel is showing how those challenges come together. Cleaning up the bones of the dead plays a prominent role in the novel, Mengestu points out before asking why its such an issue. In war, burying the dead is not a priority, Beah says. Cleaning up their bones becomes an important ritual. Life in the place was put on hold. The dead are left unburied, grass begins growing up through the floors of homes. All of these things need to be reversed, almost as if the people are returning to a blank place. One of these challenges in beginning over again is that the people need to balance feelings of nostalgia with finding a new way. The reality hits you as you are trying to live again, he says. The important thing is being tied to the land, to their ancestors. Mengestu asks about the tension between the elders’ nostalgia and the young people without nostalgic ideas. Beah says that often there is this conflict between old and new in returning back. The elders want to bring back traditions, but the younger people, especially for a generation born only after the war, they want something different. The trouble is, the young people still need to find it. A generation may not understand what those pre-war traditions even were. They don’t know what they want. The novel is about characters trying to hold together their friends and family despite this conflict. Language is an important part of storytelling process, Mengestu says, probing Beah’s approach. Beah explains that one of the languages he speaks is Mende, a major language in Sierra Leone. For him he thought of the elders as speaking in Mende, and then he found a way to translate that into English. “I believe, as a writer, language fits landscape,” he says. Mende though is not something that can be translated directly into English. He cites anger as a concept. In Mende, a direct translation might indicate an English equivalent of a hot heart or a fire in the heart. Neither is an appropriate English translation, but he attempts to achieve a similar symbolic translation, though one that is also accurate in English. The result is a richer text. He also says that young people in the rural areas speak differently than those near the capitol. Mende near the capitol is more speckled with English than rural speakers. Beah borrows from the oral tradition as much as he does from a novelistic tradition. Mainly for him this means the cadence of language. Oral stories are also the kind that are infused into a person’s bones over time from the repetition of telling the story over and over again. He also mentions the relationship of people to landscape as extremely important. In the novel, the characters are faced with a mining company extracting minerals from the land. The landscape becomes its own kind of character, Mengestu points out, and violence continues to happen to the land even after the war ends. People have histories and ancestors connected to the land, Beah explains. Its not so much that the mining company is coming to extract things from the land but the way the mining companies go about the extraction. Its not just about digging into the ground. Digging a grave is different than stripping the land for minerals. “Land is a sacred thing,” he says. Finding a place for a town requires a ceremony, not just a place. During the war, even though people were killed they could always go back to the land. They could be buried there, or return to their ancestors’ burial sites. But with mining, if the land is destroyed or flooded over, they no longer have access to that land. Mining is a bigger problem than the war because of this. Mengestu asks about Beah’s interactions with the people there in places like rural Sierra Leone and how many witnesses he spoke with. People are exhausted from interviews, he says. But because he grew up there, because he was part of that community, he could have a casual conversation with them. But ultimately the benefit of fiction is that as the author, he decides about what goes where in the narrative. Writing fiction seemed easier to him then writing the memoir. With the novel, he was the creator of the world. He could get lost in the world. He wanted to sit down and enter into it. With the memoir, it was a place he didn’t want to go back to. He only went back to those memories because he felt he needed to write the book. Writing for Beah is one of the ways he can help. He tries not to talk politics but instead to talk about the people. Writing about politics inevitably takes the humanity out of whatever the topic is. His university degree is in political science, he explains, so he knows how cold and unfeeling that kind of writing can be. He says he doesn’t want to have a specific goal in mind when he is writing, only that he wants to bring people out of their comfort zones. He goes back to Sierra Leone often. Its the place he wants to be. Whenever he is there, he leaves copies of his books around for people to read. Mostly they are appreciative that he has told their stories. But his books are creating a bit of a tourist boom. People are showing up to take pictures of the places he’s described in the memoir. There is a literary circle growing in Sierra Leone. Beah says he’s read at the university there as well. A member of the audience asks both Beah and Mengestu why neither of them write happy stories about Africa. Beah cedes the microphone to Mengestu who explains that its not about writing happy stories or sad stories. Its just about writing stories. “Travel brochures tell happy stories,” Megestu says. Even if he were writing a story about Brooklyn, it would probably be sad because happy stories are boring. When he asks Beah to add to that, Beah declines. For now, Beah intends to keep writing fiction. He has some ideas he’s already working on. Mostly he thinks its too soon for him to write a second memoir.